Ted Underwood, working with Michael Simeone, developed strategies for visualizing topic models. Most methods for computing topic models have ontologically fuzzy boundaries, and so focusing on a single topic is risky. Underwood produced a correlation matrix of the topics and connected topics in this graph that are strongly correlated with each other. Size is logarithmically proportional to to the number of tokens. 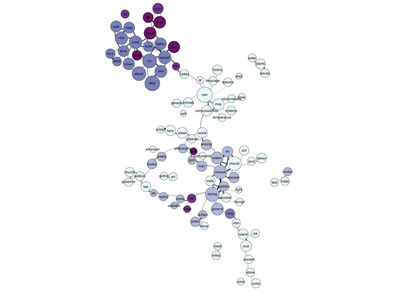 Even this kind of network model, however, suggests visual structure that isn't necessarily there. 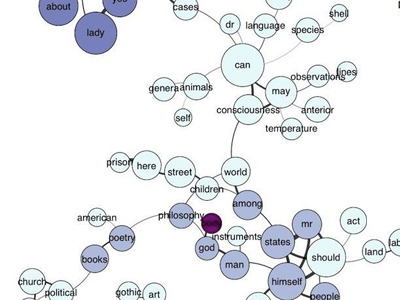 Underwood goes further to suggest the use of PCA to visualize the relationship between topics.